The Relic - On The Hip Strip! If you are fan of history and adventure, you'll treasure Fort Montego. You'll also appreciate that it is conspicuously and conveniently situated between the heart of downtown Montego Bay and The Hip Strip (Gloucester Avenue). 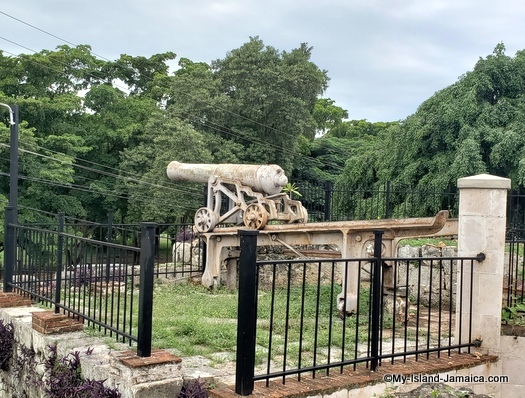 According to the Jamaica Heritage Trust, the fort was originally built in 1750, it was then known as Fort Frederick, and later as Fort George. The latter, Fort Montego was designed by European engineers and built by enslaved Jamaicans to guard the town of Montego Bay. Built in the shape of a polygon, the traditional shape of forts, it had a battery armed with cannons and a barrack to house 100 men. It had an armoury for weapons and ammunition (more on that below) as well as a small hospital with 40 beds. The JNHT added that it also housed four 12 pounder guns and five smaller guns. It was built to defend the town of Montego Bay but it was deemed an inefficient fort. History records that in 1760, one of the fort's rusting guns exploded and killed one of the gunners while he was firing a salute to celebrate the surrender of Havana. 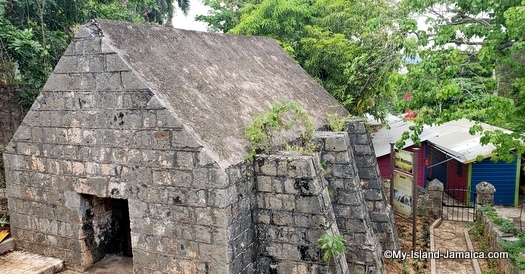 Noted Jamaican historian, Edward Long, who, a few years later found the fort in decay, theorized it was not worth the cost of repairing, especially, according to him, because the location of the fort was not very strategic to defend the town of Montego Bay. The fort was said to have only fired at a ship once! And that was in 1795 when the officers at the fort fired at their own English ship - mistaking it for a French privateer. Luckily no one died. It was last manned in 1832. Surprise, surprise! That was my reaction. I knew of the cannons at he fort very well, but never knew that their was an armoury still behind it - situated on the inside of the craft market! Heavily fortified, the armoury was the building where weapons and ammunitions were kept safe. The walls which are still extremely thick provided protection from direct hits, even the rooft is built from cut stone to deflect shot fired at it. By the way, did you know that there was also a well located here at the fort? More on that below. Yeah, your surprise was just as mine. According to the inscriptions on the banner, this well, a cylindrical shaft, was built with bricks and cut stone, enabling water to be drawn from one of the streams that runs underground into the bay. It has been modified by adding a wooden covering and a shingle roof - as seen above. When we checked it was still quite deep but there was no water in it at the time of our visit. Quite interesting isn't it? And just so you know, all this history is yours to see as it is located inside the Old Fort Craft Market and Heritage Park. 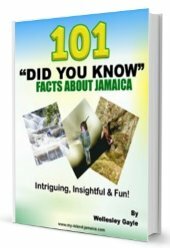 Be sure to read up on the major historical sites in Jamaica here. 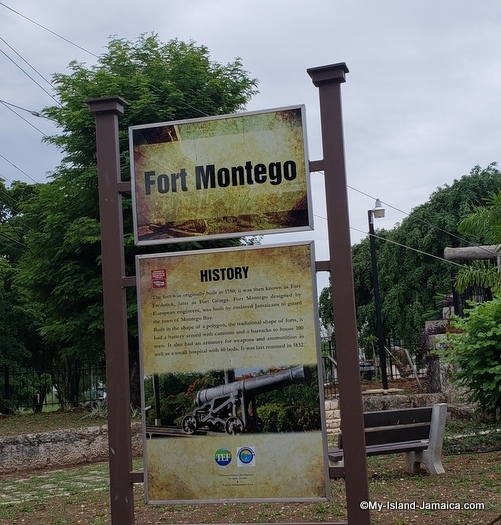 And while on the subject of the fort in Montego Bay, I'll briefly share a few snippets on the history of Montego Bay with you below, as showed on the Fort Montego banner. Montego Bay was originally settled by the Tainos. Columbus arrived in 1494 on the 2nd voyage, anchored here in the bay and called it Golfo de Buen Tiempo or the Gulf of Good Weather. The Spanish used it to ship Manteca for lard from the slaughtering of wild hogs. The name Montego is derived from the name Bay Of Lard or Manteca. The town played roles in the second maroon war, 1795-1796 and again in the 1831-1832 rebellions by the enslaved against slavery. Since the start of the 20th century, it became a major international tourist destination. 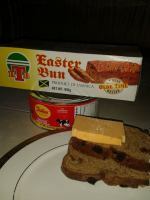 For the complete article on Montego Bay, click here.